URB-STD-1000-00 - Upper Rudder Bearing Standard for a 1 Inch Rudder Stock. The TidesMarine Upper Rudder Bearing-Standard (URB-STD) is designed to be mounted directly on top ..
URB-STD-1250-00 - Upper Rudder Bearing Standard for a 1 1/4 Inch Rudder Stock. The TidesMarine Upper Rudder Bearing-Standard (URB-STD) is designed to be mounted directly on ..
URB-STD-1375-00 - Upper Rudder Bearing Standard for a 1 3/8 Inch Rudder Stock. The TidesMarine Upper Rudder Bearing-Standard (URB-STD) is designed to be mounted directly on ..
URB-STD-1500-00 - Upper Rudder Bearing Standard for a 1 1/2 Inch Rudder Stock. The TidesMarine Upper Rudder Bearing-Standard (URB-STD) is designed to be mounted directly on ..
URB-STD-1750-00 - Upper Rudder Bearing Standard for a 1 3/4 Inch Rudder Stock. 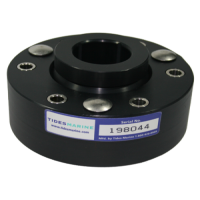 The TidesMarine Upper Rudder Bearing-Standard (URB-STD) is designed to be mounted directly on ..
URB-STD-2000-00 - Upper Rudder Bearing Standard for a 2 Inch Rudder Stock. The TidesMarine Upper Rudder Bearing-Standard (URB-STD) is designed to be mounted directly on top ..
URB-STD-2250-00 - Upper Rudder Bearing Standard for a 2 1/4 Inch Rudder Stock. The TidesMarine Upper Rudder Bearing-Standard (URB-STD) is designed to be mounted directly on ..
URB-STD-2500-00 - Upper Rudder Bearing Standard for a 2 1/2 Inch Rudder Stock. The TidesMarine Upper Rudder Bearing-Standard (URB-STD) is designed to be mounted directly on ..
URB-STD-2750-00 - Upper Rudder Bearing Standard for a 2 3/4 Inch Rudder Stock. The TidesMarine Upper Rudder Bearing-Standard (URB-STD) is designed to be mounted directly on ..
URB-STD-3000-00 - Upper Rudder Bearing Standard for a 3 Inch Rudder Stock. The TidesMarine Upper Rudder Bearing-Standard (URB-STD) is designed to be mounted directly on top ..
URB-STD-3250-00 - Upper Rudder Bearing Standard for a 3 1/4 Inch Rudder Stock. The TidesMarine Upper Rudder Bearing-Standard (URB-STD) is designed to be mounted directly on ..
URB-STD-3500-00 - Upper Rudder Bearing Standard for a 3 1/2 Inch Rudder Stock. The TidesMarine Upper Rudder Bearing-Standard (URB-STD) is designed to be mounted directly on ..
URB-STD-3750-00 - Upper Rudder Bearing Standard for a 3 3/4 Inch Rudder Stock. The TidesMarine Upper Rudder Bearing-Standard (URB-STD) is designed to be mounted directly on ..
URB-STD-4000-00 - Upper Rudder Bearing Standard for a 4 Inch Rudder Stock. The TidesMarine Upper Rudder Bearing-Standard (URB-STD) is designed to be mounted directly on top ..
URB-STD-4500-00 - Upper Rudder Bearing Standard for a 4 1/2 Inch Rudder Stock. The TidesMarine Upper Rudder Bearing-Standard (URB-STD) is designed to be mounted directly on ..